MAINGEAR, an award-winning PC system builder of custom desktops, notebooks, and workstations, offers PC gamers and enthusiasts the next generation of NVIDIA architecture that delivers a powerful new graphics solution to redefine smooth, seamless, lifelike gaming on their award-winning desktop systems. The NVIDIA GeForce GTX 680 is the fastest single GPU graphics card on the market today with superior power efficiency that allows for the card to be extremely quiet, along with new key visual technologies as well as added multi-display capabilities. MAINGEAR desktops equipped with the new NVIDIA GeForce GTX 680 graphics card offer the fastest graphics performance to date thanks to NVIDIA's GPU boost technology, which dynamically maximizes clock speeds based on the workload of the program to push performance to new levels and brings out the best in every game. This new generation of NVIDIA graphics provides the best gaming experience possible with maximum detail settings enabled. Gameplay will also not just have faster frame rates; with NVIDIA's innovation of Adaptive Vertical Sync, gamers will see ultra-smooth gaming every time without sacrificing performance. This technology dynamically adjusts VSync to current frame rates for maximum playability while maintaining smooth visual quality. The NVIDIA GeForce GTX 680 offers 2048 MB GDDR5 video memory and supports DirectX 11 and comes equipped with NVIDIA Surround multi-monitor gaming on a single card, supercharged NVIDIA's PhysX physics engine and 3D Vision technology that transforms hundreds of PC games into full stereoscopic 3D with wireless NVIDIA 3D vision glasses. In addition, gamers can take advantage of the unbeatable power of dual SLI or 3-way SLI. Additionally the card offers 2 DVI, 2 mini-display ports, and 1 HDMI output, allowing for up to four monitors to be connected at once. "The Ultimate PC deserves the Ultimate GPU, and the NVIDIA GeForce GTX 680 built in our desktops offer the best gaming experience that is the quietest and fastest card we have had in our desktops." says said Wallace Santos, CEO and Founder of MAINGEAR. "This GPU solution offer gamers and PC enthusiasts with a top performing system whether they are looking for a single, dual or 3-way SLI setup." 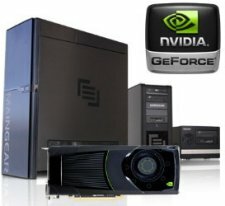 The Nvidia GeForce GTX 680 graphics will be available on the SHIFT, F131, and X-Cube MAINGEAR desktops initially and will be offered on the VYBE in the near future, along with their EPIC innovation line of product offerings such as their EPIC CPU Liquid cooling solution. All MAINGEAR products are supported with lifetime labor and phone support in the US, along with one to three year hardware warranty options.